My mother is really a paleo original. She raised my brother and me on a diet remarkably similar to the paleo nutritional template, long before “paleo” entered the national vocabulary. But more than adhering to any particular dietary dogma (she experiments with new foods and cooking methods, plus attempts reintroduction regularly) my mother insists on the highest standard of food quality. While she enjoys a Diet Coke or a bowl of corn chips with salsa as a treat, her diet overwhelmingly consists of grass-fed meat or sustainably sourced seafood. Fresh, local vegetables. No refined sugar, high-fructose corn syrup or soy products. No white flour, no nightshades (such as tomatoes or potatoes). She suffered from digestive ailments for much of her life, but rather than fixate on deprivation, she became an unrepentantly joyful eater of the cleanest foods available… and she hasn’t lost her sense of humor or taste (pun intended) for experimentation in the kitchen. Part horse whisperer and utter animal lover, her insistence on high quality extends to the food for the animals on our family ranch, much of which she mixes by hand: when I was making this chocolate gingerbread cake she took the coconut oil out of my hand (“that’s the dogs’ coconut oil, it makes their coats shiny”), explained that the odd whitish ice cubes in the freezer consisted of mare’s milk (single-serve portions for testing on her complexion, à la Cleopatra) and offered up fresh ginger aplenty for this recipe, since she had it in quantity to grate into the horses’ food to combat a sudden herd-wide cold. I consider myself reasonably dedicated to responsible eating, and in possession of an appropriately experimental palate, but my mother leaves me far behind. 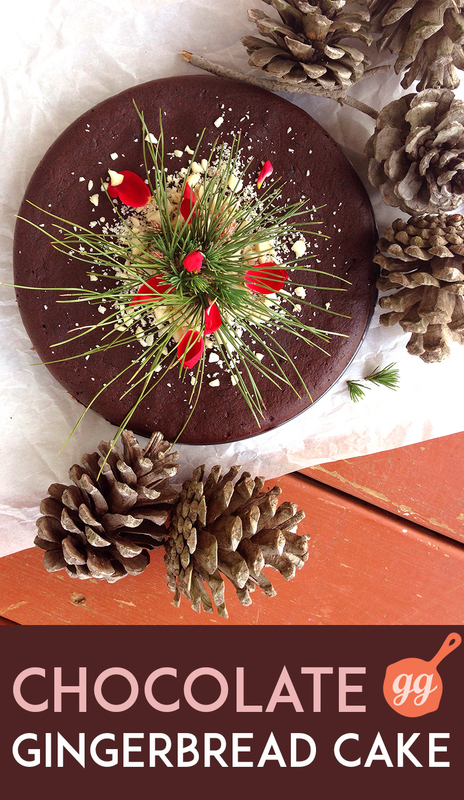 Which brings me to this paleo chocolate gingerbread cake recipe. My mother and I are on a quest for the perfect gingerbread cake, and our creation this year is a dense, rich, deeply-flavored chocolate cake with a warm boost from an all-star cast of holiday spices: ginger, cinnamon, nutmeg and cloves. This is most definitely not the style of gingerbread for making men and houses from, and if you like your gingerbread mild, sweet and lightly-colored… this is not the gingerbread you’re looking for! Lastly, purists may dismiss this gingerbread cake due to its lack of molasses but, well, the cake is chocolate. So I’m very sure the purist boat has already sailed! The dry mix for this is mostly cocoa, and now is the time to use your richest, darkest, fattiest cocoa for max chocolate impact. Brace for chocolate impact! And the same goes for the cinnamon: no dusty, flavorless cinnamon fished out from the back of the cupboard, please. Use only the ripest, spiciest, freshest cinnamon for a double-down on flavor. This cake is dark, rich, and heavily spiced without much sweetness, so if you prefer a sweeter version, up the maple syrup to 3/4 cup and decrease the coconut milk to 1/4 cup. 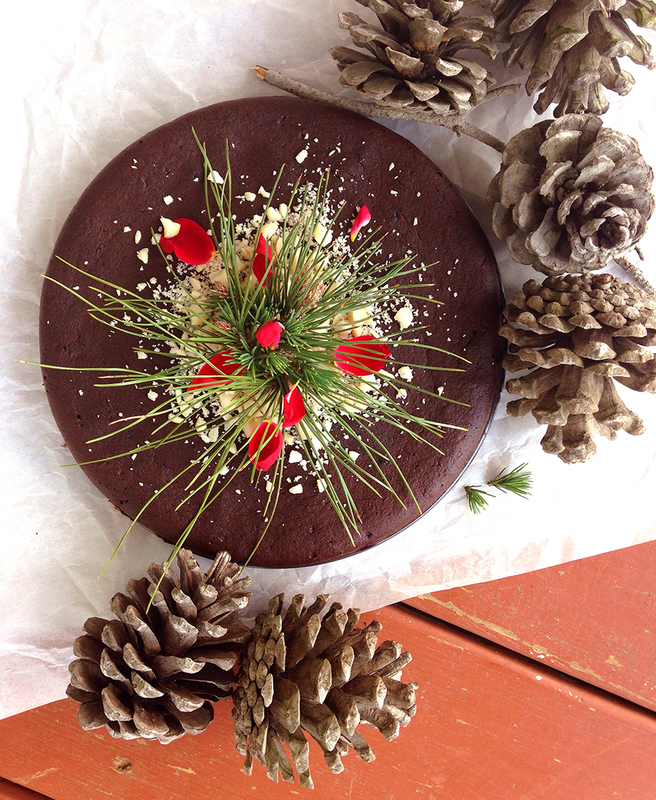 For decoration I raided our front field for some sprigs of wind-blown pine and the last of the winter roses for a pop of festive color, but feel free to enjoy this chocolate gingerbread cake as it’s meant to be served: in narrow, chic slices dusted with chopped macadamias or piled with coconut cream. This gluten-free, nut-free, dairy-free chocolate gingerbread cake is a festive addition to your holiday table. Preheat your oven to 325° F. Grease an 8" round springform pan with coconut oil and line it with a circle of parchment paper in the bottom and a strip of parchment paper around the sides. Set aside. In a large mixing bowl, whisk together the cocoa, coconut flour, tapioca flour, cinnamon, ground ginger, nutmeg, cloves and salt. In a separate mixing bowl, use a mixer to combine the eggs, maple syrup, coconut milk, vanilla extract, grated fresh ginger and the melted coconut oil (adding the oil last). Add the dry ingredients to the wet ingredients, and whisk thoroughly to combine. Pour the batter into the greased and lined pan and bake for about 35-45 minutes or until a tester inserted comes out clean. Let the cake cool in the pan for 15 minutes, and then gently release the springform and use a spatula to ease the cake onto a serving plate or cake stand. Top with chopped macadamia nuts and whipped coconut cream, if desired. Feel free to experiment with skipping the parchment paper step, but my instinct has always been to err on the side of caution... especially considering the effort and expensive ingredients that are necessary to make a grain-free cake. I love reading about your mom, how you grew up and learning more about you. The ranch sounds amazing and you are so lucky that you can cook Paleo dishes with your mom. I hope you have an amazing holiday! The cake sounds insanely decadent. Too bad my oven just broke. The universe wants me to continue with the Whole 30 and leave those Paleo baked goods alone. Yay, hope you like it!